Hot off the press (released on 30 September) is the news that the World Health Organization has revised its HIV guidelines to recommend that anyone who tests positive for the virus should be treated immediately irrespective of CD4 count, with the aim of averting 21 million AIDS deaths and preventing 28 million new infections by 2030. 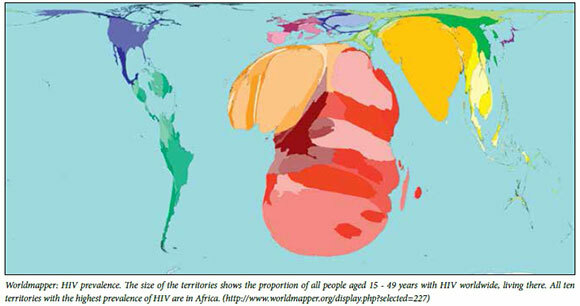 We shall have to wait to see whether our National Department of Health and Treasury decide that this can be afforded, given that South Africa (SA) is home to 5.51 million of the world's population infected with HIV (out of 37 million), accounting for a third of all HIV-related deaths annually. Few would argue that vaccines protect children against illnesses that cause death and disease. In the wake of the news of the success of a vaccine against Ebola,[3,4] we learn in this month's guest editorial('Vaccination saves lives -dare we allow the anti-vaccine lobbyists to prevent it?') of SA's proud record of availability of vaccination of her children. Most recently, human papillomavirus vaccination of girl children (boys too, it is hoped, when the vaccine is cheaper) has been rolled out. Fortunately too, according to Jacob and Coetzee,missed opportunities for immunisation in health facilities are low, at least in the Western Cape metro, reflecting good immunisation coverage among those children who do access health facilities. According to the latest census (October 2011), 35.2% of SA inhabitants have access to the internet and, as in the USA, might be expected to 'Google' for health information. Against this background, Burnett et al. advise in 'A profile of anti-vaccination lobbying on the South African internet' that the South African Vaccination and Immunisation Centre is constantly exercised by requests to explain the validity of internet-based anti-vaccination claims, when immunisation is in fact one of the best public health measures ever invented. Local web pages for anti-vaccination lobbying exist, created by those with financial interests in discrediting vaccines and who have largely taken their misinformation from web pages originating in the USA. The concern is that young parents are using a search engine like Google to seek information about vaccination, and are encountering misinformation instead. The craziness of failure to vaccinate infants and children against common infections is a hangover of the 1998 fraud that vaccines cause autism, perpetrated by Dr Andrew Wakefield and published in, and later retracted by, The Lancet. In 2010, the General Medical Council ordered him struck off the medical register, barring him from practising medicine in the UK. Wakefield's full 'dishonest, 'unethical' and 'callous' behaviour is revealed in an article by investigative journalist Brian Deer that won him the 2011 Pulitzer Prize for his 'tremendous righting of a wrong. A recent study published in JAMAthat surveyed >95 000 children confirms that no link exists between measles, mumps and rubella (MMR) vaccine and an increased risk of autism spectrum disorder (ASD), even among children whose older siblings have ASD and were already at an increased risk of ASD. 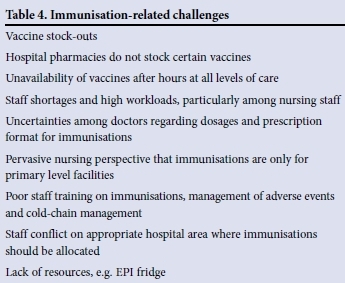 However, as Jacob and Coetzee show in Table 4 of their article (reproduced below), immunisation-related challenges remain. Apropos the above, a measles epidemic rages in equatorial Africa, attributed by the Médecins Sans Frontières team in Katanga to the difficulty vaccinators face in reaching the population over impassable roads, while trying to prevent inactivation of the vaccine in the torrid equatorial temperatures. There are reports of death rates of up to 19% (v. the global average of 1.7%) among children who not only have measles but also respiratory diseases, malaria and malnutrition. Also cited are 'poorly trained health personnel, a population constantly on the move, the refusal of some groups to accept vaccination on religious or cultural grounds, and armed conflicts in several areas'. From Stefan et alcomes a first report from the South African Children's Tumour Registry (SACTR), a paediatric cancer registry that covers the entire country. The article provides estimates of cancer incidence and discusses the challenges of cancer surveillance and control in childhood populations in a middle-income country like ours, and constitutes an invaluable resource of information for policy planning and research. The report challenges us to improve the diagnosis and notification of childhood cancer to both the National Cancer Registry and the SACTR, and to tackle the ethnic inequalities in access to appropriate care. Lucretia Petersen* is a senior lecturer in audiology in the Division of Communication Sciences and Disorders at the University of Cape Town. She holds a master's degree in audiology. Her research interests include hearing screening, ototoxicity and the improvement of early detection of hearing loss. She was deputy programme manager for the Ivan Toms Hearing Screening project in the Western Cape (2008 - 2010) and was involved in the implementation and evaluation of the project, as well as the training of primary healthcare nurses to conduct the screening. Lebogang Ramma* is the current Head of the Division of Communication Sciences and Disorders at UCT. He completed his undergraduate and postgraduate training in audiology in the USA, and also worked for four years in both public and private healthcare facilities in California, USA. He holds a clinical doctorate in audiology (AuD), is a Master of Public Health (MPH) and has a postgraduate diploma in health economics. His research focuses on applying public health principles to the practice of audiology. *Petersen L, Ramma L. Screening for childhood hearing impairment in resource-constrained settings: Opportunities and possibilities.